McClain’s Dalton Mischall carries the ball while Eric Anderson blocks down field on Friday at McClain High School where the Tigers battled Troy Christian in football action. The McClain Tigers hosted the Troy Christian Eagles on Homecoming night with storm clouds on the horizon most of the game. The weather remained calm throughout, but the Tigers homecoming was still rained on, losing by a score of 34-14. The Eagles received the opening kick and after a nice return began their opening drive on their own 45-yard line. After moving the ball successfully on the ground, Troy Christian Head Coach Ryan Jones opted to take a shot to the end zone. An underthrown pass allowed cornerback Eric Anderson to intercept the errant throw. It appeared as if the Tigers first possession of the night was going to stall with the first two plays going nowhere. However, H-back Dalton Mischall received the handoff from quarterback David Jett and exploded through the defense for a 70-yard gain on 3rd and 12. Three plays later, Mischall took a jet sweep eight yards to the end zone to stake the Tigers to an early 7-0 lead. The Eagles opted to keep the ball on the ground on their ensuing possession and proceeded to march down the field. With the ball on the two-yard line on 4th and goal, the Tigers couldn’t stop the Eagles from punching it in on a run by running back Jason Blake on a drive that took nearly seven minutes off the clock. The Tigers failed to answer on their ensuing possession and were forced to punt after a quick three and out. The Eagles again went to the air on their next possession. This time, however, the Eagles opted to play it safe with wideout Brady Clawson turning a bubble screen into a huge gain all the way to the Tigers eight-yard line. Two plays later, quarterback Caleb Twiss found Nathan Waltz in the end zone for an eight-yard touchdown pass to give the Eagles a 14-7 lead. Penalties plagued the Tigers on their next possession, again going three and out. After a shanked punt, the Eagles were set up with prime field position on the Tigers 25. The Eagles took advantage of outstanding field position and quickly struck on a six-yard touchdown scamper for Black, extending their lead to 21-7 with 40 seconds left in the half. The Tigers received the ball to begin the second half and proceeded to gain a little much needed momentum. The Tigers began to move the ball on the ground but found themselves in a third and long situation. This time, Jett found an open receiver to keep the drive alive. Later that drive, the Tigers were faced with another tough situation with a 4th and 2 near midfield. McClain head coach Jake Orr-Zody rolled the dice, which turned out to be a wise decision with his team bearing down and achieving the first down. On the next play, Mischall found a seem in the Eagles defense, carrying the ball to their own 14 on a 32-yard run play. However, the momentum quickly swung back to the Eagles when Jett’s pass was intercepted by the Eagles. With momentum squarely in the Eagles favor, they proceeded to march right down the field behind outstanding running by Black. Black ultimately polished off the drive with a 15-yard touchdown run to extend the lead to 27-7. The Tigers couldn’t seem to gain any traction to cut into the deficit and were forced to punt on their ensuing possession. Black continued to pick up yards on the ground and move the chains for the Eagles. With the ball on the 18-yard line, Twiss threw a jump ball to the end zone which his receiver was able to come down with to pad the lead moving into the game’s final stages. With time running out, the Tigers refused to quit and moved the ball well on the ground on their way to a 20-yard touchdown run by Pat Fout. However, the game had long since been decided and the Eagles were able to run the clock out for a 34-14 win on the road. 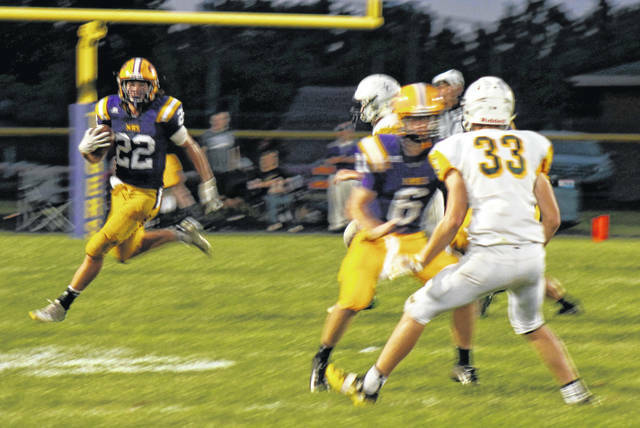 Up next for the Tigers is on the road at Miami Trace next Friday, game time is set for 7:00 p.m.
https://www.timesgazette.com/wp-content/uploads/sites/33/2018/09/web1_McClain-Homecoming.jpgMcClain’s Dalton Mischall carries the ball while Eric Anderson blocks down field on Friday at McClain High School where the Tigers battled Troy Christian in football action.